We are expert Rice Krispie square makers around these parts. The girls love to help make them, and we love dying the marshmallows different hues to make a fun and colorful treat. We were looking for a totally new and different snack to make the other day, when we came across a recipe for Muddy Buddies. Also known as "Puppy Chow" or "Monkey Munch". Apparently animals everywhere love this stuff! We happened to have a whole unopened box of Rice Chex up in the pantry and I thought let's DO this. 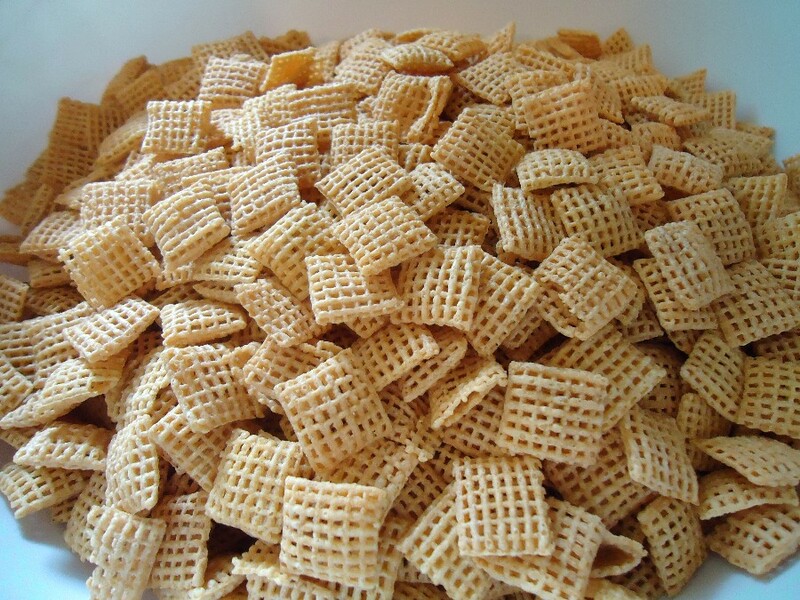 First, measure 9 cups of Chex cereal into a big bowl (lightly sprayed with cooking spray) and set aside. In a small (microwave safe) bowl, pour 1 C chocolate chips, 1/4 C of butter, and 1/2 C of peanut butter. The girls had fun measuring all these cups, half cup, quarter cups themselves and pouring them into the bowls. Next you want to put the bowl in the microwave and cook for 1 minute. Stir and do another :30 seconds at a time, stirring in between until completely melted together. Add the vanilla at this time and stir until combined. After that you want to immediately pour the chocolate mixture over your bowl of waiting cereal. Next the recipe says to "pour mixture in a 2-gallon plastic zip lock bag"... Well hello there Chex executives, but my biggest bag is 1-gallon, who has a 2-gallon plastic bag? Do they even make those? Instead, I thought let's put it into the container we are going to store it in, and shake it with the lid on! I'm sure I'll be nominated for some kind of mom genius of the year award for that one. Once in the container, dump in 1 1/2 cups of powdered sugar, put on the lid, and shake your money maker (while shaking the muddy buddies). Hubby wants to add, don't shake it too hard, rather slowly rotate it around till everything was covered in powdered sugar, you don't want broken muddy muddies. Deliciousness is about to happen... I can feel it. From this point on, my girls started calling these "Snow Buddies"... because the powered sugar coats everything and makes them white. Okay, rather a grey/brown/white, but who's keeping track? Pour your mixture out onto some sheets of wax paper to cool. By this time, your whole house smells like you just made peanut butter cookies. It's awesome. After they were cooled and dried out a bit, we put them right back into the container with matching lid and they were ready to store. We of course, chowed down on them first. They have a great flavor of that delectable chocolate peanut butter taste, plus an added bonus of crunch. Sort of like if Reese's Peanut butter cups and powdered donuts had a baby with a rice krispie treats. I must warn you... these are hard to stop eating once you start. That's why I want to rename them "snack crack". Another few ideas are: You can package them up in baggies for school treats, preschool snacks, after school snacks, and these would even be great in a cute package for teacher gifts or Christmas gifts for neighbors. Make a batch for your next movie night. Enjoy!